Hello! 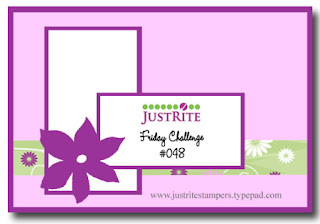 It's JustRite Friday Challenge time again! This week's challenge, JRC_048, is a sketch challenge -- I love sketches and I know a lot of you do, too.. I hope you will join us! I combined a couple of JustRite stamps for my card today. The frame is from CL-02070 Fancy Frames - Cling, which I stamped twice, once for the background frame and cut out with JR-08950 Nested Frames die and a second time using Labels Fourteen to cut out the sentiment layer. "Happy Birthday to You!" is from the ribbed set, JB-08117 3 1/4" Birthday Celebrations - Interlocked. My embellishment is a handmade yo-yo topped with a Prima rose. Accessories: JR-08950 Nested Frames (Spellbinders co-branded), Labels Fourteen Nestabilities (Spellbinders), Ribbon (May Arts), Yo-yo, Moda fabric, Rose (Prima), Foam tape, Thread, Sewing machine. Just love the colours you've used in this card. It's such a soft and restful card! I love that pretty rose. Beautiful card Stephanie! Love your little yo-yo! My Mom taught me how to make those and we used to make yo-yo quilts :) Thanks for the sweet memory! Beautiful card, Stephanie! I LOVE your gorgeous BG paper, your gorgeous bow and that fun yo-yo!!! I have just stumbled on to your blog and I have to say I just love this Card.. It is so beautiful..
Great card - lovely soft muted colours. Thank you for my positive comments also - appreciated! 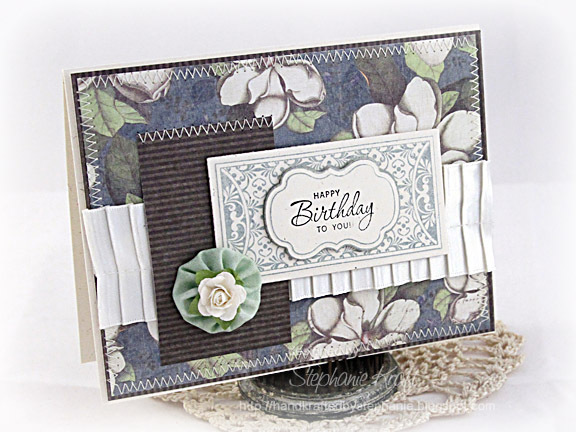 Beautiful design and the colors are yummy on your card. The paper is wonderful and really wows! Stunning card Stephanie!!! Love the yo-yo!